“I do,” is one of the shortest sentences in our English language and yet it carries a promise that’s too vast to be measured by man. It’s not one thing we do, but a thousand little things that make up the sum of our vows. Long-lasting love doesn’t happen by accident. We don’t find ourselves holding hands after twenty-five years with the one that we love by pure chance. Love is deliberate, it’s intentional, it’s purposeful, and in the end it’s worth every minute that we give of ourselves to another. 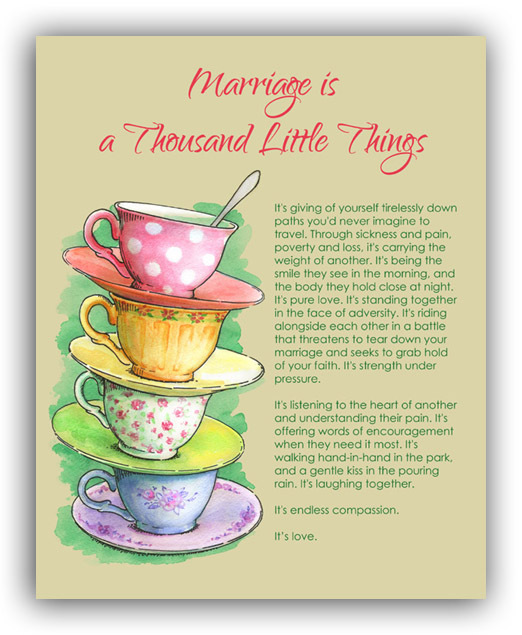 Marriage is a thousand little things. It’s giving up your right to be right in the heat of an argument. It’s forgiving another when they let you down. It’s loving someone enough to step down so they can shine. It’s friendship. It’s being a cheerleader and trusted confidant. It’s a place of forgiveness that welcomes one home, and arms they can run to in the midst of a storm. It’s grace. It’s giving of yourself tirelessly down paths you’d never imagine to travel. Through sickness and pain, poverty and loss, it’s carrying the weight of another. It’s being the smile they see in the morning, and the body they hold close at night. It’s pure love. It’s standing together in the face of adversity. It’s riding alongside each other in a battle that threatens to tear down your marriage and seeks to grab hold of your faith. It’s strength under pressure. It’s listening to the heart of another and understanding their pain. It’s offering words of encouragement when they need it most. It’s walking hand-in-hand in the park, and a gentle kiss in the pouring rain. It’s laughing together. Marriage is ordained by an almighty God, and when we live out our vows according to His incredible wisdom and grace… it never fails. Want the printable? 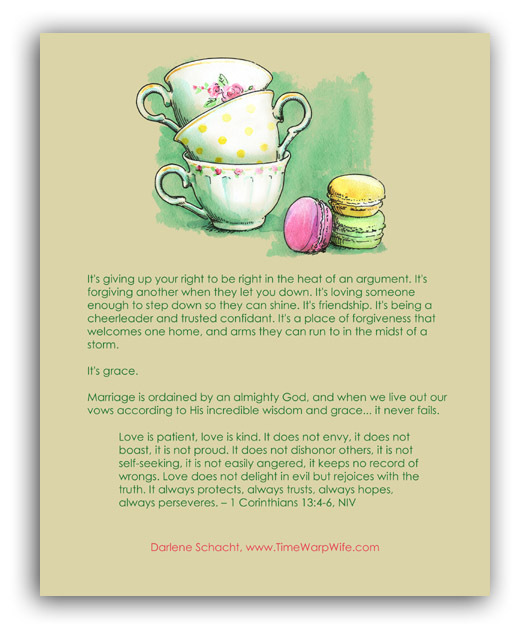 It’s two pages–both high resolution for clear printing, set to print out at 8 x 10 inches each. Click the images below to download and print your copies. Or click here. Please note that the files are large, so if your computer is slow, or you’re trying to open them on an iPad, you might have a little trouble. I split the PDF into two files to help with download. Hope you like them! Note: KJV is also available. Click image to find all three files. These are beautiful! Thank you so much for sharing them! I love it! Could u make a printable that has the verse from the KJV? We don’t hang anything in our house from others versions but I really love this.. Yes, I’ll get that up in a couple of hours. The link will be below this one. I love this article! Very well said. 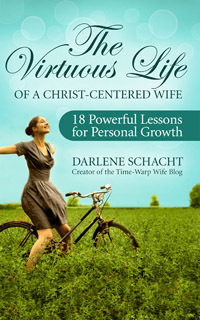 All marriages take work to keep them strong, healthy and Christ centered but oh the rewards that are gained in the end. It is sad in our society that many people miss the boat in this area. Thanks for reminding us of the biggies in life. In the end it all comes back to the two of us when our kids are grown and we want that season to go forward with a strong partnership we have firmly established through the years! Thank you for your ministry to marriages. I am a counseling pastor at our church and I have found your material very helpful. I want to encourage you by praying for your ministry. God bless you. Thank you so much for your encouragement. I’m glad you enjoy it. LOVE THIS INSPIRATION!!!! Thank you for sharing this masterpiece !!! Blessing to you !!! You’re welcome! Thanks for stopping in, Andrea! I’ve treasured this nugget of a good marriage since I first read it. I also have the very special memory of reading it to my darling husband in our last moments together, as he passed from this life and onto his eternal journey.